An artist's concept of the Voyager 1 and Voyager 2 probes near interstellar space. The edge of our solar system is filled with a turbulent sea of magnetic bubbles, according to new NASA research. Scientists made the discovery by using a new computer model, which is based on data from NASA's twin Voyager probes. 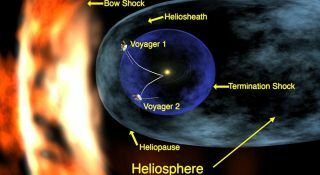 The unmanned Voyager 1 and Voyager 2, which launched in 1977, are plying the outer reaches of our solar system, a region known as the heliosheath. The new discovery suggests that researchers will need to revise their views about the solar system's edge, NASA officials said. A more detailed picture of this region is key to our understanding of how fast-moving particles known as cosmic rays are spawned, and how they reach near-Earth space. Cosmic rays are a threat to astronauts, as they can slam into spaceflyers' cells and damage their DNA. Earth's atmosphere attenuates cosmic rays, shielding folks on the ground from their worst effects. NASA hasn't revealed many details about the new find. The space agency will hold a media teleconference at 1 p.m. EDT on Thursday (June 9) to discuss it in more depth. — Arik Posner, Voyager program scientist, Heliophysics Division, Science Mission Directorate, NASA Headquarters, Washington, D.C.